Thanks to hybrid vigor, first generation Zuchons are generally healthier than their parents. However, prospective buyers should be aware that all pedigree lines carry certain inherited disorders that can be passed on even to their hybrid offsprings. 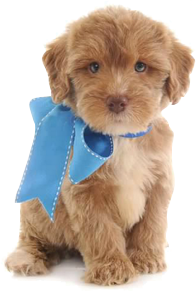 Although it’s impossible to eliminate every health condition or disease, it’s a good practice to check the health clearances of both the parents of the puppy you’re looking to buy. A good breeder should offer health clearances – proof that a dog has been tested for and cleared of a certain health condition – from an independent agency such as the Orthopedic Foundation for Animals or the Canine Eye Registration Foundation. Below are some of the diseases and conditions documented in the Zuchon. Keep in mind that not all Zuchons will get any or all of these diseases. Allergic dermatitis or Atopy is an inflammatory, chronic skin disease that is caused by an allergy to substances in the environment. The Bichon is particularly predisposed, and signs may be seen from as young as four months of age. Symptoms include itching, scratching, hair loss, greasy or flaky skin with a foul odor. Brachycephalic airway syndrome is a combination of anatomical abnormalities in very short-nosed dogs that cause increased airway resistance and respiratory distress. 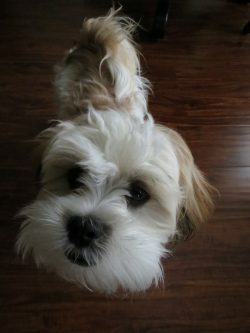 This is commonly seen in some Zuchons that inherit the Shih Tzu’s facial features. Surgery is necessary for some affected dogs to widen the nostrils, shorten the soft palate, and/or to trim excess tissue from around the larynx. Cushing's syndrome happens when your dog’s body makes too much of a hormone called cortisol. This chemical helps him respond to stress, control his weight, fight infections, and keep his blood sugar levels in check. But too much or too little of it can cause problems. Symptoms include hair loss, weight gain, skin thinning, and excess thirst. Immune Mediated Haemolytic Anaemia, also known as IMHA, is caused by the dog’s own immune system attacking the red blood cells in their body and destroying (called haemolysing) them at a faster rate than the bone marrow can make new ones. As a result, the dog becomes progressively anaemic and clinical signs will develop. Signs include breathlessness, weakness, and collapse. Keratoconjunctivitis Sicca, or “Dry Eye”, is an eye condition where the cornea and conjunctiva become inflamed due to a lack of tear production by the lacrimal gland. Over time, the lack of tear production leads to corneal cloudiness, redness, and pigmentation, which in turn causes vision loss and ocular pain. When tear production is low, the eye also produces a thick yellow/green mucous, which is often mistaken as infection. Hip Patellar luxation is a common orthopedic problem among dogs. The patella, or kneecap, normally rides in a groove (trochlear groove) within the femur (thigh bone) of the knee. But in some dogs the patella can slip out of this groove, usually when the knee is flexed, causing varying degrees of lameness.